Most of the stocks trader will be angry after reading this post. Do not worry guys, "I know the golden eggs are always in my basket." However, forex market is more attractive than the stocks market in so many point of views. This post is for those who trying to decide between stocks market and forex market. I am not writing this post to underestimate the stocks trader rather to present some facts that may encourage the new traders to be involved in forex trading over stocks trading. 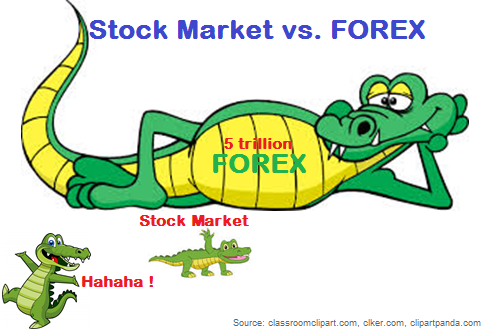 Read along the post to know "Why forex trading is better than stocks trading." Firstly, forex market is open 24 hours and 5days in a week, but the stocks market is open for a limited time frame daily. So, you can trade forex anytime you are free, if you are not a full time trader. Secondly, every individual stocks has its unique fundamental analysis, that is why studding the fundamental of over 5000 stocks in the market is almost impossible for a trader. Additionally, stocks traders also need to study the macro economic factors. In fundamental analysis of a currency, a trader should only study the economic factors of certain number of economies. Thirdly, unlike stocks brokers, forex brokers charge no additional fees or commissions for the transactions. Forex brokers only charge a tight spread for every trades. Comparing with stocks, forex trading involves lower cost of transactions. Fourthly, the orders can be executed immediately in forex market, but in case of stocks market immediate order execution is not possible. It is surely an advantage because the uncertain political or other news can be announced anytime and effect the open orders. Fifthly, a currency pair can be profitably traded when either it is going down or up, but the stocks cannot be traded while going down. So, in forex traders can make profit when a currency pair is either bullish or bearish. The forex traders need to determine the direction of the price movement. Sixthly, forex trading can be started with a small initial investment like 20 US Dollars, but stocks trading with this amount of initial investment is point less. Not only this, but forex trading is more profitable than stocks trading. A 1000% profit can be possible in forex market. Finally, forex market price cannot be manipulated by any individual, institution or group because of its gigantic size, but the price of a stocks or shares are manipulated by the institutions with big funds. Dear Traders, these are the points that encouraged me to be a forex trader. If you have any question about this post, you can drop a comment below to join the discussion. Nice description over two segments of capital markets, forex market and equity market. Trading under Forex market and stock market, both requires different trading strategies and recommendations. This blog gives me more knowledge about forex trading and it show forex trading is better than stocks trading. I want to build a new business. So i need some information that's why i was finding a good website where i can take more business related information. Then i found this blog. Now i read your blog content attentively. I am very satisfy because i got some information which information will help me to build my business. Today i also happy for www.fibogroup.eu because i have Forex business. They were helped me to grow my Business. Excellent information on your thank you for taking the time to share with us. Amazing insight you have on this, it's nice to find a website that details so much information about different artists. Great post. Thank you so much..
At present most of the businessman choose your website. Do you know why? Because of your great info. Now i read your blog info attentively then i got lots of business ideas from this website. I am really so happy for your info. I am also happy for 24biz.biz because they gave me financial support for grow my personal business. Thank you so much for your valuable post. Great market trends related to share market, including both Equity Trading and Nifty Future updates by Epic Research. Great article thanks for sharing...! !